Hand-stitched (4 hours of work! ), cute, kitchey and cursing! 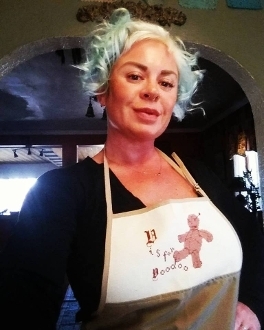 My assistant made me one of these aprons for a gift and I adore it-I wear mine during all my dirty conjure work! Features an adorable voodoo doll with pins! 27 inches long from top of decorative bib to bottom. Super easy adjustable neck and tie back.